matryoshka nesting dolls | Hip Hip Hooray! Nesting dolls seem to be popping up (get it, popping?! ) everywhere these days. 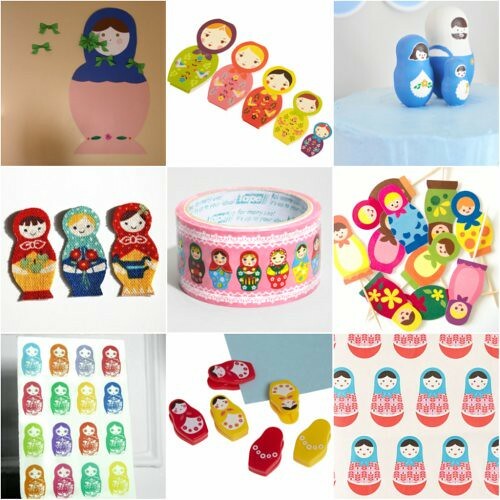 Here are some favorite products and ideas that could be included in a nesting doll party. Nesting dolls are my new obsession! My husband bought me the matryoshka measuring cups for Christmas and now I am hinting for the measuring spoons and cups I have seen. We are thinking of incorporating them into our Kitchen decor. So cute!! Too bad I don’t have a daughter…She would so be having a Matryoshka doll birthday party! I hosted a friend’s baby shower with this theme – it turned out SO CUTE! We even had matryoshka cookies, and wrapped napkins using the gift wrap in the bottom right corner. LOVE.